So I’ve been really wanting to add more color to my Halloween and fall decor game. I mean, I LOVE color so why the heck not? Who says Halloween has to be black and orange only, anyway? I’m hardly the only one embracing my love of color these days and I am so in love with what that means for seasonal crafting, aren’t you? 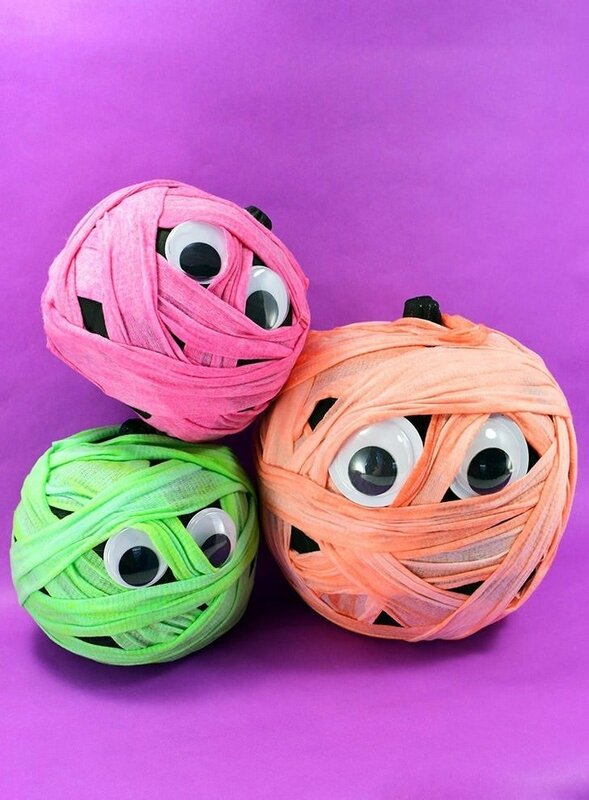 So when I started working on some colorful ideas I thought why not dye up some bandages for colorfully cute mummy pumpkins? And you know what? This might be my favorite no carve pumpkin craft of 2017, truth be told! For this project I decided to use actual gauze rolls because I thought it would be the easiest thing to do and, in truth, it was super easy but you can save a little bit of $$$ by cutting fabric or cheesecloth, or what have you into strips yourself. 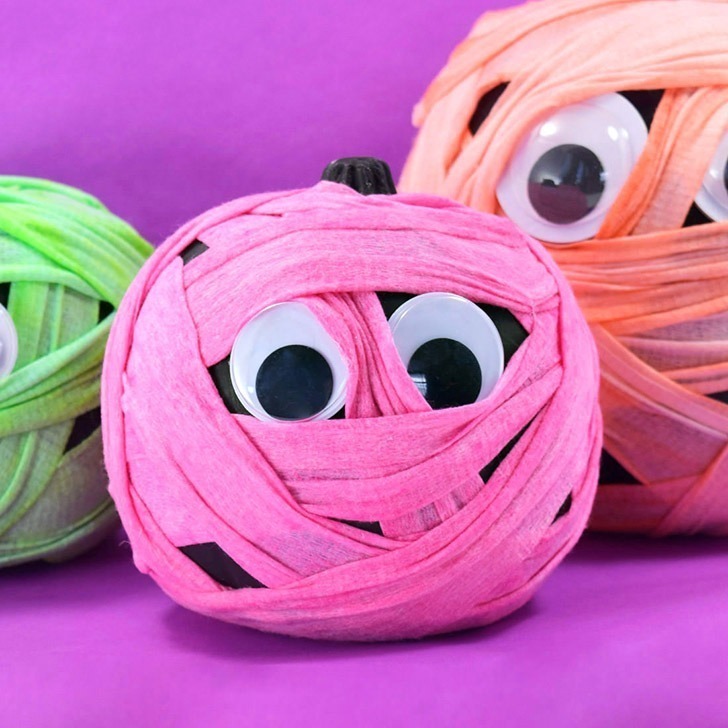 Plus if you go with a fabric that is full cotton, your bandages will take the color a bit better than mine, which has some man made materials to give the gauze some stretch that didn’t take the dye giving my mummies a more faint color than they could have taken on. In all honesty, I’m super stoked with how these turned out and I guarantee they’re going to be a part of my Halloween scene for years to come! 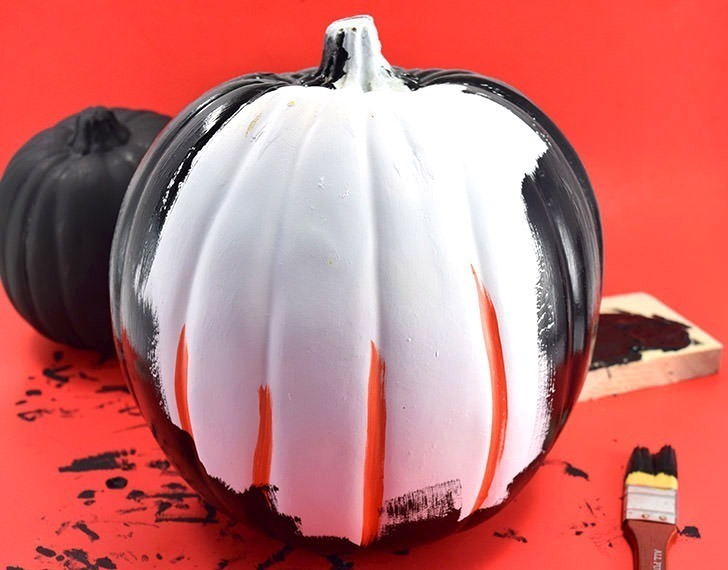 To start you’ll need to paint your fake pumpkins black. A good, matte black is best as it will just disappear against the colorful gauze. 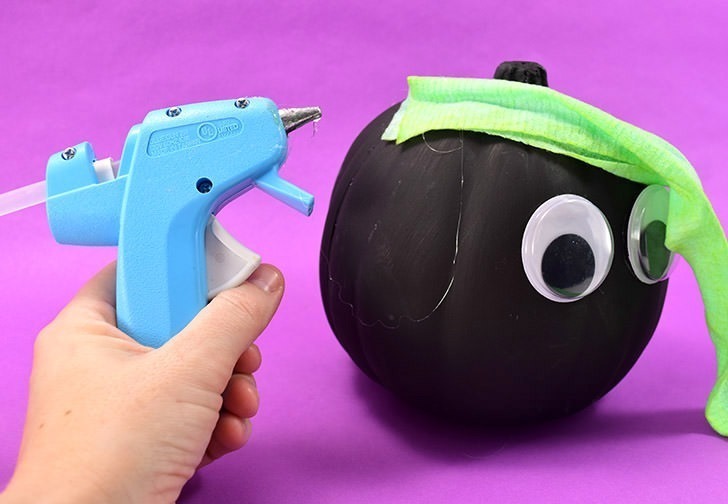 Now I wound up painting my no carve eyeball pumpkins because after the exterminator sprayed them in the gardens whatever ant killing serum he used made the pupils fall off and I was freaking over it (as in, didn’t want to remake them). And so after a good scrub and a new paint job, they became mummies. Works for me! To further prep for this project you’ll need to dye your gauze or fabric. I used small and medium fake craft pumpkins from Michael’s for my project. The smaller pumpkins require a single roll of gauze 2″ x 90″ long gauze and the medium require 2 rolls. If working with the largest craft pumpkins from Michael’s, I’d imagine you’d keep increasing by a unit, needing to dye 3 rolls for the biggin’s. 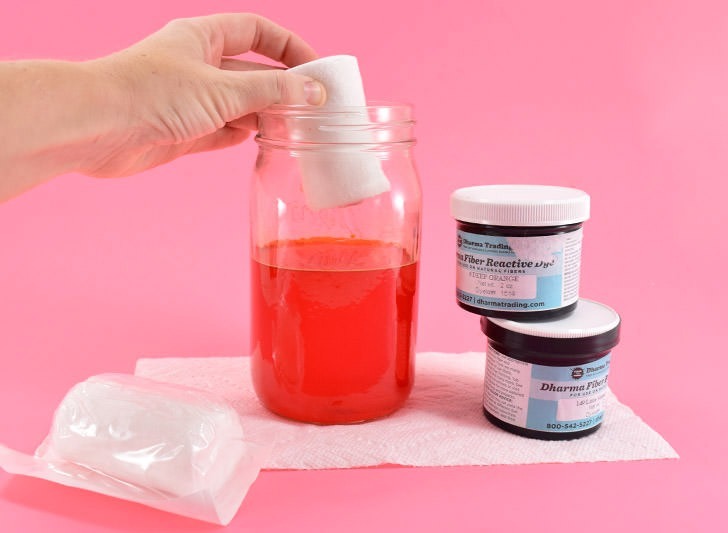 To start prepare the dye according to manufacturer’s directions in a small batch, a mason jar works super well. Unwind the gauze into the dye and stir every hour or so, allowing the gauze to sit in the dye for a good half of the day. 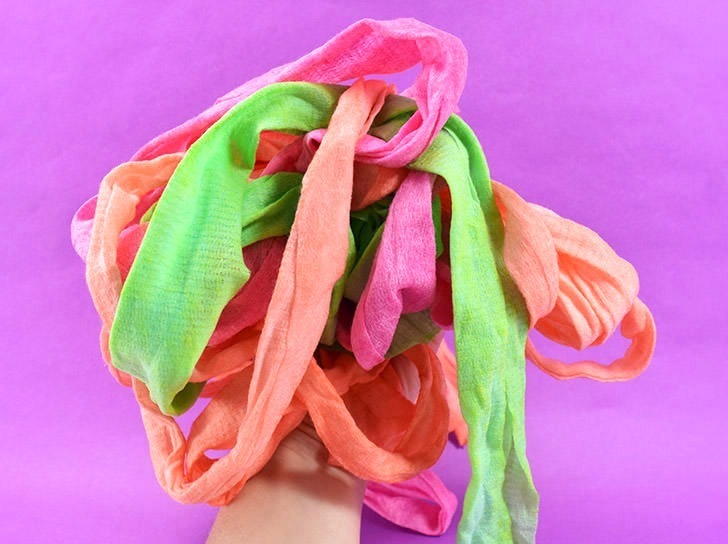 Wearing gloves, remove the gauze from the dye and rinse out the excess color. Hang and allow to drip dry. As a side note, you might notice I added my gauze in a roll for the orange color and this worked out okay, but you might also notice that my orange pumpkin isn’t quite as bright as the others. I even went back and unrolled the gauze and tried to redye it to take on more color, but that just didn’t work out. 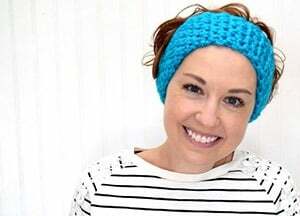 Loose gauze will take the color more evenly and more vibrantly, so be sure to do that! 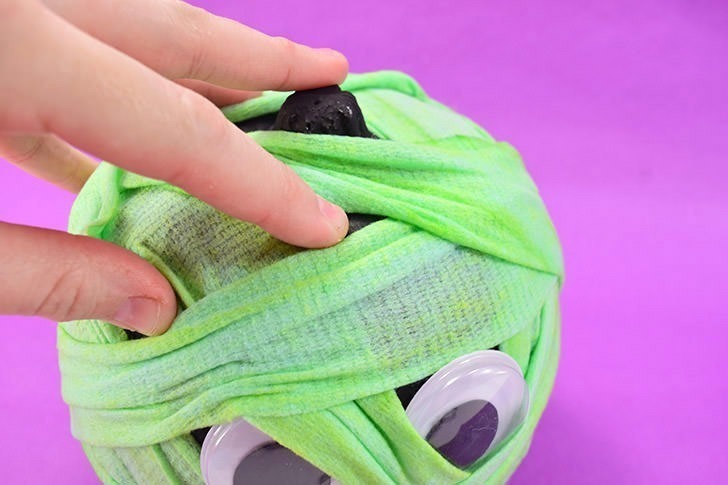 Are you ready to make some mummies? ‘Cause I know I sure am! 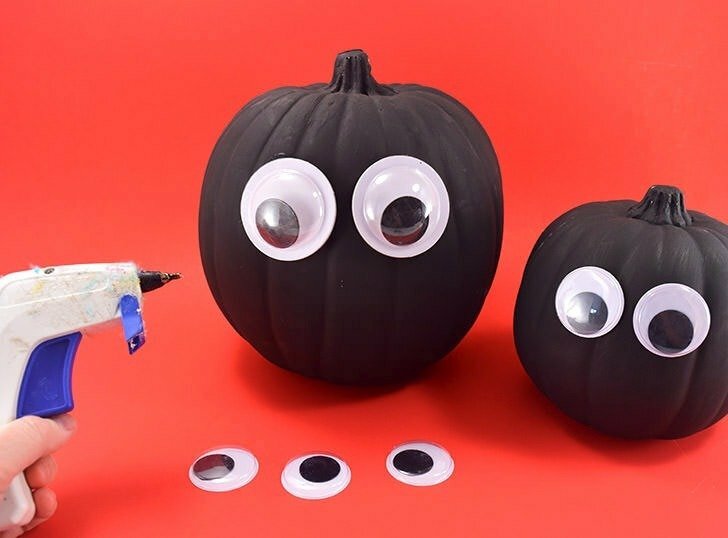 Take large googly eyes and glue them to a little higher than the middle of each pumpkin. For the small pumpkins my eyes are around 1.5″ and the medium sized craft pumpkin took 2.5″ eyes, in case you’re wanting the same proportions as mine. 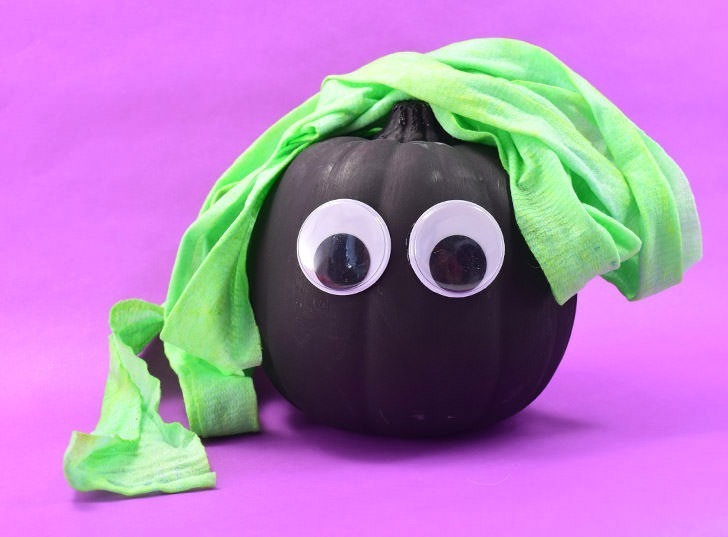 The backs of the eyes are flat and the surface of the pumpkin is curved so to keep them steady you’ll need to go heavy with glue right in the middle of the eye as most of the edges, if not all of the edges, won’t make contact with the pumpkin’s surface. 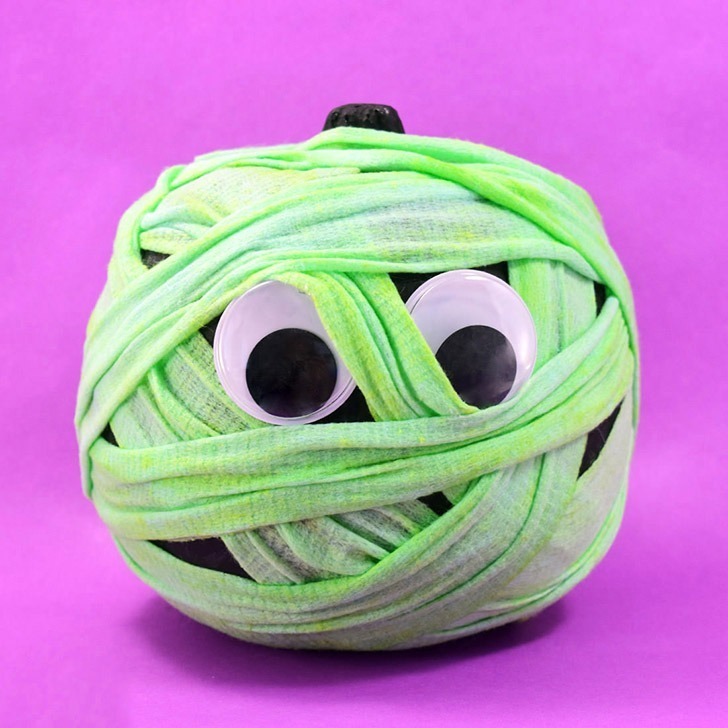 Using your hot glue tack the end of your gauze onto the back or under side of your pumpkin. Glue will seep through the fabric so use something like a pencil to push the gauze into the glue and prevent any burns. Alternatively, if working with children you can use just about any glue you’d like, but I’d suggest the super quick holding Fast Grab Tacky Glue by Aleene’s. Wrap and wrap the gauze, taking care to go around the eyes and over the space in between the 2 at least once. You want the pumpkin to be almost completely covered, with exception of the eyes. Glue the end piece in place and allow to dry. 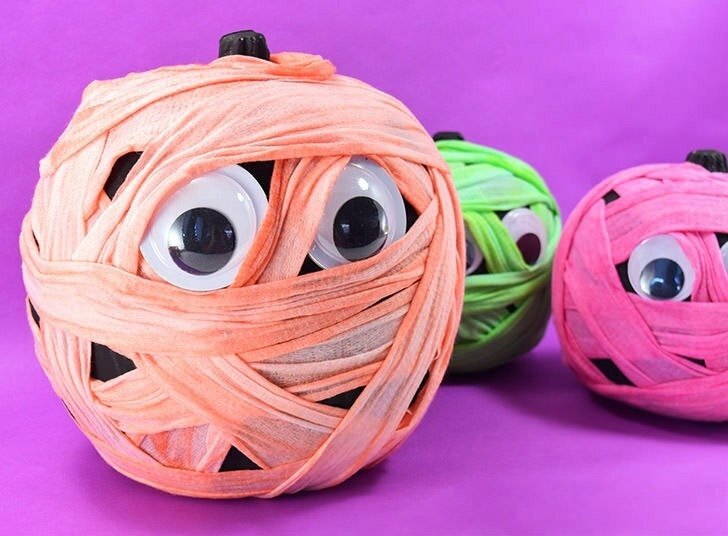 Take your fingers in between the bandages and slightly move them to allow the black pumpkin to peek through, giving the bandages more definition. BOOM! Isn’t that the cutest darn thing you’ve ever seen? OMG. I super love these guys! If you’re going to be storing these guys for next year, I’d strongly recommend going around and occasionally tacking the bandages down to help prevent it from unraveling when getting tossed around in a box. Even with that little extra step, this project is so easy and so cute and I love it so much. I just want to know, what color are your colorful mummy pumpkins going to be?